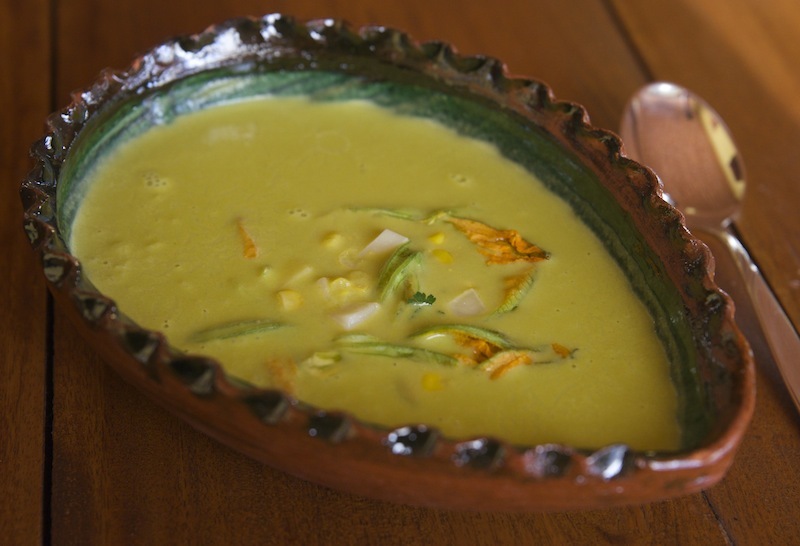 If you can get hold of fresh zucchini blossoms then try this wonderful soup! This one is in honor of Gloria who was generous enough to share her family memories of this soup with me. She told me how nice it would be to have a good recipe so I searched my vast collection of cooking books and found a recipe I adapted from the great Mexican Chef, Ricardo Munoz Zurita. He has done a lot for the promotion and research of Mexican culinary traditions and has written many books on the subject. 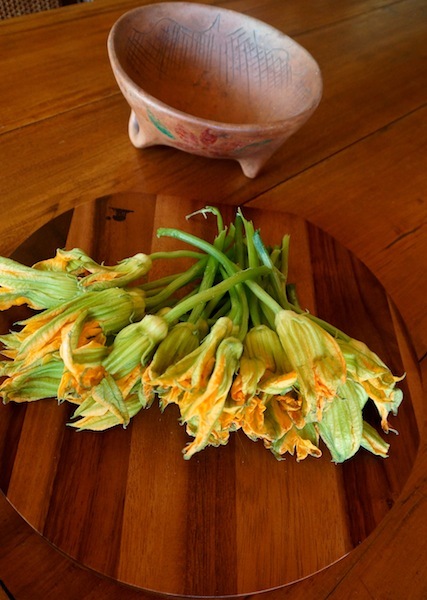 In Mexico the Zucchini blossoms are widely used, be it in quesadillas with cheese, in omelets, in different soups, in the filling of chicken breasts and even crepes. Bring a saucepan of water to a boil, add the blossoms and let them boil for 1 minute. Drain them in a colander and shake off the excess water. Add the blossoms to the icy water. Once cold drain, chop and set aside. Melt the butter in a saucepan, then sauté the chopped onion until it begins to soften. Stir in the Zucchini blossoms and let them cook for 3 minutes. Add the flour and stir until slightly golden. Pour in the chicken stock and when it starts boiling, add the cream and salt. Let it boil for 5 minutes more. Check the seasoning. Let it cool a little bit and then blend until smooth. Set aside in a saucepan since you should warm it up again just before serving. To serve, divide equally the cheese cubes and the corn among fours soup bowls and then top with the warm soup. Decorate with a line of heavy cream (if using), the zucchini blossoms julienned and sprinkle with a bit of parsley. My family and I loved the soup, it was smooth, velvety and the cheese gave it an extra bite, each ingredient complemented each other perfectly. It was a big hit with my three year old daughter who asked for a second and third servings! Thank you so much for finding and sharing with us this fine recipe. Can’t wait to try it. Love your blog. I do enjoy the recipes but much more when they come with some background of its origins. Wonderful! Thank you so much for your kind words. Do let me know how you like it once you are able to do it.